After 20 years of building up a collection of scooters from all parts of the world, Brisbane's Joe Dercole puts it all up for sale. Joe Dercole has been collecting scooters for the past 20 years. And in this time he has certainly collected some rare examples. This has to be one of the first major collections of vintage scooters to go on sale in Australia with the age of the 18 scooters combined totaling an amazing 884 years old. With the need to create a whole heap of new room Joe has made the painful decision to part with his collection. Below you will find the details of each individual scooter for sale and even a video compilation where you can see most of the scooters for sale from different angles. If your interested in a certain scooter why not make an offer via email and thus start correspondence between buyer and the seller. All email offers will be considered and the highest offers in the end will be sold the scooter. Selling prices will be posted on each individual model. Select "Watch in high quality"
The fifth Le Minz 24 Hour Scooterthon is shaping up to be the biggest yet, and with organisers confirming a switch from September to February, the pace is set to glow red-hot around the clock on the Gold Coast. The Parklands precinct will again host the event, which will be fought out over 24 hours – midday on Saturday February 14 to midday on Sunday February 15. Hailed as the world’s longest and most gruelling scooter reliability test, a full field of riders will grid up to determine which manufacturer and 50cc model has the reliability and fuel efficiency to go the distance. In 2007, 18-year-old Jake Dolan eclipsed the existing Guinness World Record by covering 1178.76km in 24 hours on a TGB 101S. When the event returns, both individuals and teams of up to three riders will attack the existing benchmark, vying to write themselves into the record book. To do so they will need to turn over 1500 laps of the 660m track on showroom-spec scooters. Mark Petersen of Exhibitions and Trade Fairs said the organising team had been inundated with enquiries about the return of the popular event. “Over the years Le Minz has generated a strong following from within the industry and receives plenty of mainstream exposure as well – it’s a unique concept and one of the most demanding events of its kind in the world,” said Petersen. The Le Minz 24 Hour Scooterthon is open to any manufacturer exhibiting at the Australian Motorcycle Expo Melbourne or Gold Coast (also incorporating the Australian Scooter Festival). The field will be separated into 3 classes – A Class (LA Moped) , B Class and C Class. The LA Moped class includes scooters that do not exceed 50km/h and is open to both teams of up to three riders or individuals on two or four-stroke models. B and C class allow the entry of scooters that travel faster than 50km/h. For more details on entering the Le Minz 24 Hour Scooterthon, please contact Mark Petersen at Exhibitions and Trade Fairs on (07) 5535 5266. 22 August 2008 - There are always those few discerning motorcyclists who want to stand out from the ever expanding two-wheeled crowd, so the arrival of Honda's all-new, luxurious automatic cruiser, the DN-01, will no doubt be big news for those after a unique urban design unparalleled in the current market. The very latest Honda technology has been integrated into astounding concept bike looks and relaxed custom riding, along with a powerful 680cc V-twin engine and highly-styled 17" wheels. There is one major difference from most bikes of its size, however, in that the DN-01 has no clutch. Instead, Honda's low, long cruiser introduces the most advanced fully automatic transmission ever developed for any two wheeled vehicle. Strong performance is delivered through an 'infinitely variable HFT transmission' that features Drive, Sport and 6-speed Manual modes for wide-ranging performance potential. Its switch-selectable mechanical Neutral also makes for easier control when at stop. The bike's dynamic front cowl design with dual projector headlights, wide LCD instrument panel, integrated LED taillight assembly and smoothly responsive Combined-Antilock Brake System also help to make for an appealing package across the board. The DN-01 is one of Honda's most innovative R&D projects come to life, and has been built to appeal to a broad spectrum of the market. With its low seat height and technologically advanced automatic transmission, it is an ideal option for those who want an easy ride, coupled with the handling and power of a larger road bike. WIN A VESPA on Sydney Vega 95.3 FM August 25th – 29th 2008. If you have ever wished that you were riding a Vespa, well, now is your chance. Sydneys Vespa dealers along with Vega 95.3 FM have done a deal to give away a Vespa LX 50,including all on road costs, to one lucky listener of the Breakfast Show with Tony, Bec and Mikey between August 25th and August 29th 2008. Pre promotional adds will start on August 22nd, to supplement new Vespa commercials that are currently being aired on Vega 95.3 over the next 3 weeks. The adds are aimed at commuters, and are designed to get commuters thinking about riding a Vespa to work, rather than being stuck in traffic. Check out the MP3 of just one of the adds. The Scooter Store will be organising rider led group test rides throughout the day at 11.00am, 1.00pm and 3pm, with nibbles and light refreshments between rides. Each test ride will go for approximately 30 minutes with each ride purely being a demo ride. Due to demo scooter availability and popularity, it is essential that you pre-book your place prior to the day for this unique event, so that we can ensure that you get to test all the models of your choice. Till the end of November 2008, My Scooter have the sturdy and reliable Piaggio Zip 100 for just $2500 Ride Away inclusive with an open face helmet. The Piaggio Zip 100 runs a responsive 4 stroke engine thats smooth and reliable and comes with a 2 year warranty. The Zip also features a unique adjustable seat for those of us on the shorter side. Scooter Central is proud to announce that they are hosting the 'Spring Has Sprung Scooter Run' to be held on Sunday September 14 2008 . 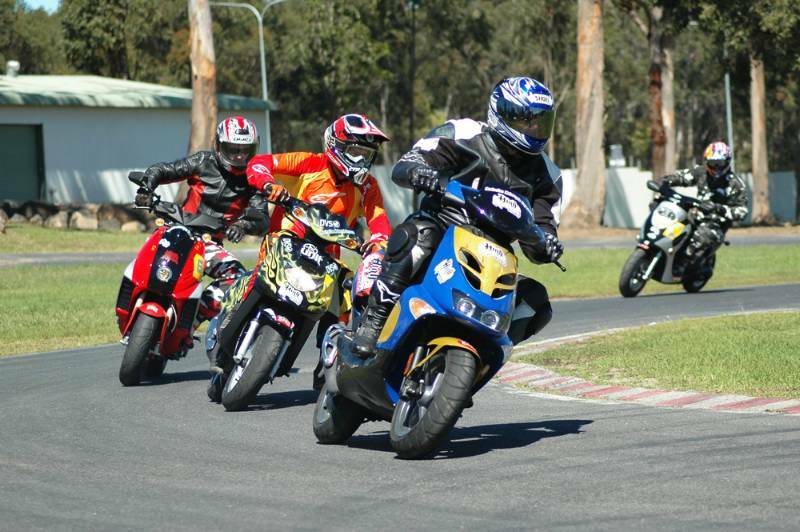 Riders are required to be at Scooter Central in Brookvale ( 551 Pittwater Rd Brookvale) between 08:45 am and 09:15 am. A riders briefing will be held before setting off. This event is free to all scooter riders, and we have ensured that the ride will not be taxing for even the smallest of scoots. This years ride will be all sorts of fun, starting with a Mystery Tour around the Northern Beaches. The Mystery Tour will see riders set off from Scooter Central in 5 minute intervals with a clue to answer to get to the next stop. Answer all 4 clues at 4 different venues and you will find yourself at our lunchtime BBQ stop. Prizes will be awarded to those that cheat the least. Scooter Central will be providing a Free BBQ lunch for all participants. Some massive prizes are also on offer for the FIRST ANNUAL NORTHERN BEACHES SLOW RACE INTERNATIONAL. In this event, rider talent will be tested as you are timed along a 15 metre long course. The rider who can stay within the boundaries of the 2 metre wide course, and doesn't touch the ground with their feet (or head) will be the winner, and showered with praise and admiration from their fellow scoot riders. Peugeot Australia announce the release of the Geopolis RS 250. Sporting disc brakes, special screen, black paintwork, red brake calipers and a titanium exhaust. SYM release the Orbit in both a 50 and 125 cc capacity. The biggest news is the price for such a scooter, $1690 for the 50 and just $2190 for the 125*. Our long awaited ultimate commuter scoota! If you want a scoota which is ultra reliable, looks great and is incredible value-for-money the Orbit is the scoot for you! It’s been a long time coming and we’ve searched for the most superior and inexpensive scoot over many long years to make sure the scoot we put our name to is second-to-none! Our friends at SYM have invested time and money into developing the most refined and inexpensive scoot to hit the world market. We are anticipating the Orbit will be the best buy for your buck for an entry level scooter buyer. As a result we are getting a scoot made to the exacting quality standards of SYM and their long history for value-for-money vehicles. The Orbit’s have super quiet 4-stroke engines, 12 inch alloy wheels, 190mm front disc brakes and fully automatic CVT transmission. And to satisfy even the most discerning buyer, we have five colours to choose from; white, red, blue, black and silver. And at only $1,690 for the Orbit 50 and $2,190 for the Orbit 125, what’s not to love? Two or four wheels, off-road or on? That’s the choice one lucky winner will have to make when they take home an incredible $15,000 prize voucher from Honda at the 2008/09 Australian Motorcycle Expos and Sydney Motorcycle Show ad Australian Scooter Festival. Visitors to any of the showcase events will receive free entry to the sweepstakes, with the winner to be drawn at the Australian Motorcycle Expo Gold Coast & Australian Scooter festival at the Gold Coast Convention and Exhibition Centre on Sunday February 22, 2009. The prize can be redeemed for any models from Honda’s range of two and four-wheel motorcycles, to the total value of $15,000 RRP (Recommended retail price)*. Or, the winner can opt to put the prize towards the purchase of a Honda motorcycle or PWC greater than $15,000 RRP, adding their own additional funds to make up the difference. The combinations and choices are endless – spoil a mate or the family, or simply indulge oneself. “We are very excited to be able to offer this amazing prize package for this year's annual motorcycle expos," said Honda Australia's Marketing Manager, Glyn Griffiths. “To be able to offer the winner $15,000 towards any bike they desire from our huge range is fantastic and is something we haven't done before in this format." "We are looking forward to the winner getting exactly what they want, whether it be a couple of scooters to run around town, a new sportsbike for track days or maybe a 4-wheeler to use on the farm." "Honda has released some amazing new models for 2008 and our line up now includes over 60 models. Most of these will be on display at each of the shows in Melbourne, Sydney and the Gold Coast so we encourage everyone to come down to our stand and have a look." Mark Petersen, Australian Motorcycle Expo Melbourne and Gold Coast and Sydney Motorcycle Show & Australian Scooter Festival Event Manager, said the Honda promotion was the biggest prize that the event had ever offered visitors. “Honda has been a proactive exhibitor at all of the Australian Motorcycle Expo events since they began and we are thrilled to be offering such an incredible prize to a lucky visitor,” said Petersen. The Australian Motorcycle Expo Melbourne will be held from October 30-November 2 at the Melbourne Exhibition and Convention Centre, with the Sydney Motorcycle Show to follow from November 21-23 at Sydney Olympic Park. To view terms, conditions and permit details, log onto www.australianmotorcycleexpo.com.au. *Unused funds will be forfeited and cannot be exchanged for cash. A range of Classic Scooter Clothing is set to hit the Australian market. To those around in the 1960's, the name Lambretta is synonymous with the original modmobile. the Lambretta scooter, and the distinctive italian influenced style of that era. This heritage and attitude that underpins the Lambretta Streetwear is what we in Australia are about to get the ability to experience. From belts to wallets, to classic tees and stylish shirts initially we will see a sample of the Lambretta Streetwear range that has grown to be a massive fashion success story across the UK. The range caters for not only those with ties to the days of Quadrophenia but is also for those with an equal good sense of fashion. Set to launch towards the end of september importer Stoney Creek Powersports has the rights to distribute this fashionable brand across Australia. Last year we saw the inaugural Boreen Point Rally and it was a huge success. Over 60 people on more than 50 scooters converged on the scenic little town of Boreen Point just north of Noosa. Be sure to book your spot on what will be a fantastic overnight run. There is some onsite accommodation with a range of double and bunk rooms and a limited number of camping spots on the grounds of the Apollonian Hotel. There is alternative accommodation within walking distance of the main meeting area. The famous pig-on-the-spit will be back and breakfast is now included in the price. The DJ will be cranking up the tunes so be sure you pack your dancing shoes and brush up on your karaoke voice. There will be prizes and giveaways. Costs are as follows note all prices include a portion for entertainment as well! Drinks not included can purchase from the bar or bring your own! We will bring a van that will travel with us for those unable to carry all their camping gear. Be quick as bookings have already started to fill! Scootersales.com.au Previews TGB X Motion 250 i.e. Scootersales.com.au gets up close and personal with the scooter range that gets back to basics with a heap of classic style. Benelli have returned to the Australian market with two scooters the Benelli Pepe 50 and the Benelli Velvet 125. More to come on the Velvet but for now lets take a look at the Pepe. Available in 2 styles the "Old Style" and the more contemporary LX the Pepe offers an excellent ride quality from its 16 inch wheels and zippy performance from its 2 stroke 50 cc motor. Initial ride impressions have been very favorable with the scooter really getting back to basics. Large wheels means a scooter with a little more prowess on the road and the Pepe has that in spades. Being 2 stroke the Pepe performs well off the line with plenty of Zip and stops just as quick by using the power mostly generated by its front disc brake. In the looks department it's a real winner with a retro style that is cheeky and retro all wrapped up into one. My favorite is for sure the "Old Style" with its splashings of chrome but you also cant go past the simple practicality that is the LX. The LX comes with a top box as standard. Couple this with a flat floor and you have a real short distance commuter that will do most things extremely well. Take a look at the following video for your introduction to the new Benelli Pepe range.